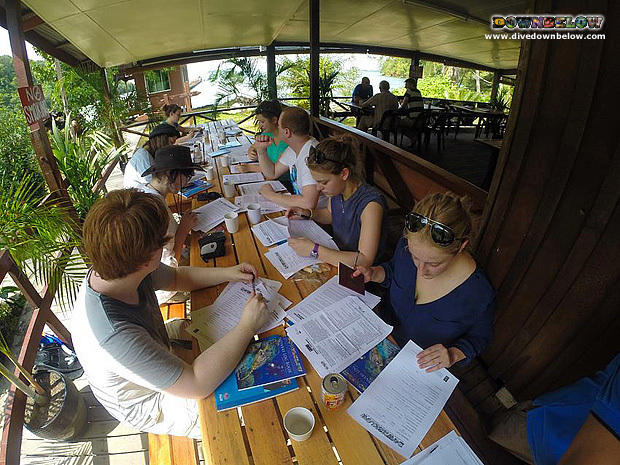 Our PADI 5 Star IDC Dive Centre on Gaya Island is currently buzzing with future marine scientists as students from the University of Cardiff in the UK are currently immersing themselves in training. As part of their Bachelors, Masters & PH.d Degrees they must go out the field and learn specialised skills they will need later on in their careers as Marine Biologists & Zoologists. During their two week program with Downbelow Instructors, the students will learn to scuba dive by completing the PADI Open Water Course. We then move on to fine tune their bouyancy skills underwater which is a critical skill required to protect the coral for any underwater evaluation. Coral identification, fish sizing, mapping & underwater surveys are also some of the skills the students must learn during this training program. Overall this is a very interesting & rewarding program for everyone involved. We love to see the groups enthusiasm for the underwater world. These young individuals are key future ocean & wildlife ambassadors! Our dive centre is a perfect setting for student groups wishing to complete any marine-related study trips and also at the same time learn scuba diving. With a shallow secluded confined water natural lagoon just in front of our dive centre the students can focus and take their time learning new skills. The island is also located just 10-minutes from the capital city of Sabah Borneo. Contact us for more information should you have any enquiries on having your group visiting our dive centre.